You may be thinking the same thing I was thinking which was, “Really? Yet another film about boxing? Didn’t “The Fighter” just come out last year? And wasn’t “The Fighter” 2010 that years, “Wrestler” 2008, while, “The Wrestler” 2008, was that years, “Invincible” 2006? How many blue collar sports movies with heart and substance abuse are going to ‘take what works and copy it'”? HOWEVER, “Warrior” is different. First off, this Cain and Abel story is actually about MIXED MARTIAL ARTS, and NOT boxing, wrestling, or football. Paddy Conlon (Nick Nolte), physically trains his son, Tommy Conlon (Tom Hardy) , while Alice Ward (Melissa Leo), managed Micky Ward (Mark Wahlberg) and Dicky Eklund, (Christian Bale). “Warrior” is a story about pent up anger and underlying frustrations from estranged relationships between father and sons, alcohol abuse, time served in the military, and the drive of how far one man will go to “not go backwards”, to be able to continue to make the mortgage payments in order to keep his home and family together. All of the preceding factors added fuel to fire, and their emotions get sorted out in the ring. Suspenseful! Terrific camerawork! MUST SEE! Harmony of an angelic choir, focus set on God and faith, Lenny Kravitz is a rock and roll genius, who has always been known for his jazzy, bluesy, funky, soulful Beatlesque qualities! From “Let Love Rule” back in 1989, to “Mama Said”, “Are You Gonna Go My Way”, “Circus”, “5”, “Lenny”, “Baptism”, “It is Time for a Love Revolution”, and NOW THE NEW, 2011, “Black and White America”. 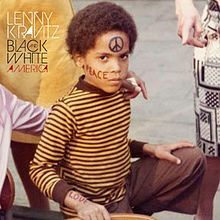 With a young Lenny with a peace sign on his forehead, the album cover resembles a young Michael Jackson from “The Jackson Five” period. On August 31st, 2011, a time when the Northeast could use a little musical escape, Samsung and AT&T helped kick off Lenny Kravitz’s “Black and White America” Tour with a free hour and a half concert at the old auto dealership, now converted into a music hall, “Terminal 5” in NEW YORK CITY!!! Most musicians would see this as a prime opportunity to play mainly new songs from their new album with only a few old songs mixed in, but NOT Lenny! Lenny understands the true meaning and value of music and life, and knows how to deliver a performance that is pleasing to everyone! The majority of the concert consisted of his classic hits that everyone could sing along with including, “It Ain’t Over ’til It’s Over”, “Mr. Cab Driver”, “American Woman”, “Mama Said”, “Fly Away”, “Are you Gonna Go My Way?”, and “Let Love Rule”! The title and influences for his latest album, “Black and White America”, come from Martin Luther King, Jr., his parents, and the Bahamas, and include meaningful songs entitled, “Come and Get It”, “Black and White America”, and “Stand”. Fresh from “The Hunger Games” movie set in Charlotte, NC, Lenny Kravitz plays, Katniss’s friend and stylist, “Cinna”, making the man not only a musical legend, but an established film actor, as well. If you have not seen him in the social and humanitarian role in “Precious“, you must! With Hurricane Irene making her mark on the Mid-Atlantic and Northeast this past weekend, millions of Americans came face to face with their deepest fears, and were subjected to the loss of safety, security and basic needs, and their fight or flight survival instincts kicked in. “THE HUNGER GAMES” is more pertinent than ever and should be read and seen by all! Look for Lenny Kravitz in “The Hunger Games” out in theaters on March 23, 2012! You are currently viewing the archives for September, 2011 at One World Cinema.